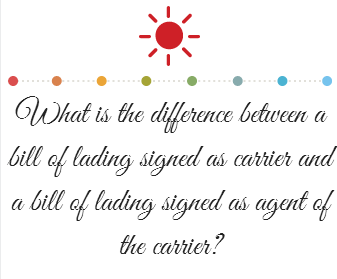 What is the difference between a bill of lading which is signed as carrier and as agent of the carrier? The party that has signed the bill of lading must indicate its signing capacity. For example, if the carrier has signed the bill of lading, then it must be indicated on the bill of lading (B/L) that it has been signed by the carrier. Likewise if the master has signed the bill of lading, then it must be indicated on the bill of lading that it has been signed by the master. How the agents of the carriers sign the bill of lading? Normally every carrier should assign an agent at sea port that they operate. These agents could sign the bills of lading that belong to the carrier with the same authority of the carrier. 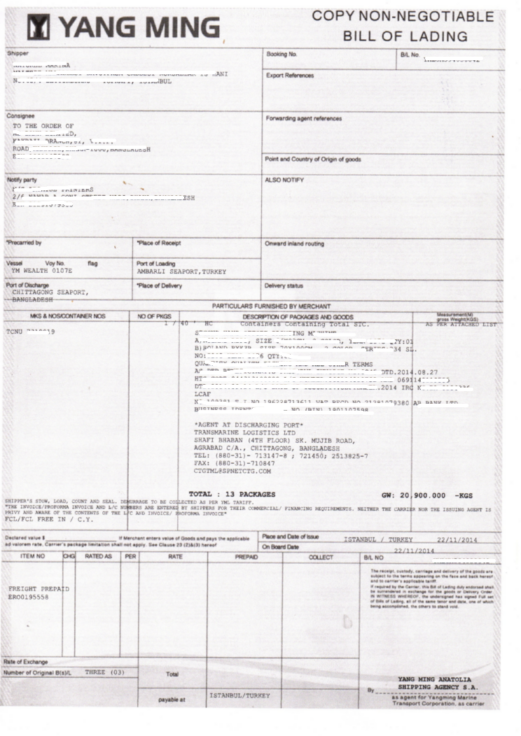 Example: On the left side you can see a YangMing Marine Transport Corporation's bill of lading. This bill of lading belongs to Yang Ming Line. It is printed carrier's own company letterhead and on the back side of the bill of lading Yang Ming Line states the terms of "contract of carriage". As this bill of lading belongs to Yang Ming Line, it can only be signed by the Yang Ming Line with the capacity of carrier or its assigned agent with the capacity of as agent of the carrier. Alternatively the bill of lading can be signed by the master. But this bill of lading cannot be signed by an unauthorized forwarder with the capacity of "as agent on behalf of the carrier". How freight forwarders sign the bill of lading? Most of the time freight forwarders are not agents of the carriers. As a result a freight forwarder cannot use a carrier's bill of lading, which they have no agency relationship. 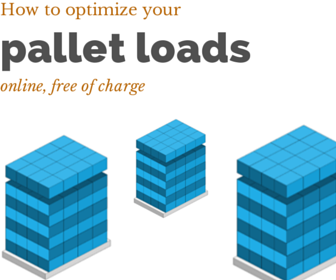 In practice almost all freight forwarders are using their own bills of lading. Example: On the left side you can see a freight forwarder's bill of lading. It belongs to a freight forwarder company. The bill of lading has been printed on to the freight forwarder's own company letterhead and on the back side of this bill of lading freight forwarder company states the terms of "contract of carriage". As this bill of lading belongs to the freight forwarder company, it can only be signed by itself with the capacity of the carrier. As you can see on the picture left, freight forwarder's bill of lading has been signed "AS CARRIER". Actually, forwarder companies do not own and operate vessels. As a result they are not the actual carriers of the transportation. But they are contractual carrier. If you would lie to learn more about freight forwarders and carriers please read my following article : What are the differences between carriers and freight forwarders?